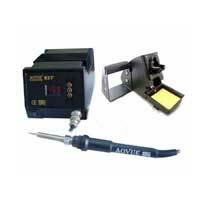 Microprocessor-controlled ESD safe soldering station, Closed loop control of temperature for precision soldering. High performance ceramic heater with removable tip design. Digital display of actual and set temperature. Easy grip soldering iron handle suitable for long hours of usage. Aoyue INT 937+ is designed with touch type panel controls for easy temperature adjustments. Aoyue INT 937 is designed with traditional knob type controls. Wide variety of available tips. 4.5" x 6.1" x 3.5"